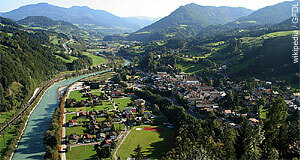 Werfen is a town in the northern part of Salzburg′s Pongau area. It is situated in the Salzach river valley and well-accessible from Salzburg both by train and via the motorway, in the so-called Tennengebirge. Werfen is a very popular day-trip destination among tourists that stay in the capital. This is largely due to two attractions: The Festung Hohenwerfen, the second-biggest fortress of Salzburg. It is based on a Medieval castle and situated in a very picturesque setting on the top of a cliff overseeing the valley. The Festung Hohenwerfen is famous for its bird of prey shows. The second big attraction are the Salzburg Ice Caves or Eisriesenwelt, the biggest ice caves of Europe that are open to visitors. Both of these attractions are covered in separate articles and won′t be discussed here in further detail. Werfen itself is a nice little village set somewhat off its two top-attractions. It has a population of approximately 3,100 and is situated some 40 kilometres south of Salzburg, just between the Tennengebirge and the Hagengebirge. Both of these mountain ranges belong to the Northern Calciferous Alps and are well-known for their abundance of caves. They are also great for advanced hiking. Werfen is one of the oldest market towns of Salzburg. It was founded in 1190 and endowed with plenty of privileges to ensure the development of an important community at this strategically important location. This included the Pfleggericht, a regional administrative and tax collecting body. After the peasant wars of 1526, Goldegg lost importance and many of its privileges were transferred to Radstadt and Werfen. The former had resisted the rioting revolutionaries successfully, the latter had surrendered without resistance - yet it was easier to control from Salzburg. Today, Werfen is is a prosperous town. Surprisingly, tourism doesn′t play an overly important role for the local economy, since most of the crowds stay just for the day and don′t spend much time nor much money in Werfen itself. Local iron and machinery industries as well as some forestry, energy companies and logistics companies are more important. In terms of sightseeing, have a look at the town centre. Here you will find the old Pfleggericht (the court house of the administrative body mentioned above), the parish church from the late 17th century, the Capuchin church Mariahilf, and the Brennhof - another court that was used as a local residence by those Prince Archbishops that happened to stay here (maybe because it was more comfortable than the military building of the fortress).